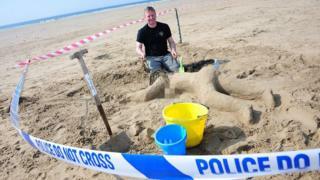 A police force has apologised after its officers made a sandcastle “crime scene” featuring a naked dead woman. 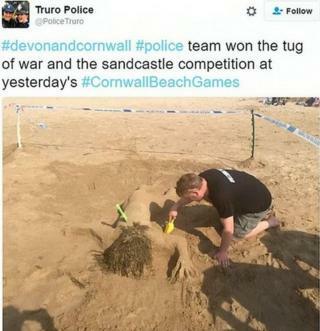 The sculpture, depicting a sprawled murder victim surrounded by police tape, was crowned winner of the Cornwall Beach Games sandcastle competition. But Devon and Cornwall Police was criticised after boasting officers tweeted about their victory. Labour councillor Hannah Toms said some would find it “very offensive”. The force said it was a “fun event” and officers had not intended to cause any offence. Ms Toms acknowledged officers had intended to be “light-hearted” but said the sandcastle “somewhat misses the mark and is in a bit of poor taste”. “I like a joke as much as the next person but this is a family beach event,” she said. “As a parent I would not be very happy to explain to my child what it was all about. Reaction on social media was mixed, with some defending the sandcastle.